Abu Omar (name changed for security reasons) had been for many years a religious scholar and highly-respected citizen of the Middle East. He taught and preached the Koran, the Hadith and Sharia law in mosques and Islamic schools. While getting into his car after evening prayers in the mosque, he noticed a piece of paper stuck to his car window. He pulled it off, climbed into his vehicle, put on the light and began reading it. Furious, he crumpled it up. Then, taking the rifle he kept in his car, he stepped out to see if he could find the person who had left the tract. Seeing no one, he threw the paper out and drove away. On the way home, he stopped in front of a shopping mall. A piece of paper flew towards him and stuck to his clothes: the same bible verse! Tearing it up, he stuffed it in the nearest waste bin. After shopping, he came back to his car and as he opened the door, pieces of paper blew towards him from the garbage can—the same ones he had ripped up and thrown there. Enraged, he gathered them up and set them ablaze with his lighter. As he drove home he felt something on his left shoulder. He pulled it off, and glanced to see a piece of burnt paper. He stopped the car to read it: “The wages of sin is death”. A terrible fear came to his mind. With other Muslims, Abu believed in two recording angels, one recording good deeds, and the other bad. He presumed ‘Atid’, the one recording all of his sins and bad deeds, sat on his left shoulder. Suddenly he felt something on his right shoulder. There he found another scrap of burnt paper. Taking it off he read: “The gift of God is eternal life through Jesus Christ our Lord.” He also held the Islamic belief that another angel named ‘Raqib’ rested on his right shoulder recording his good deeds. In frightened wonderment, he placed the pieces of gospel tract in the dashboard. Abu Omar could now barely sleep at night. He began pondering the biblical teachings on Jesus Christ. His habit had been to get up at dawn to go to the mosque for morning prayer. Abu Omar saw his nail-pierced hands and knew he had to be Jesus. He rose from the bed immediately and prostrated himself before Him. When he found the courage to raise his head, the Lord disappeared. He then heard the call for morning prayer from the mosque, but didn’t go. He rushed to his car to retrieve the pieces of burnt paper from the dash board. On the back of one, he found a mobile number and calling it, connected with Pastor Steve of Bibles for Mideast. Pastor Steve shared the gospel, and Abu Omar accepted Jesus as his own personal savior and Lord. The pastor later presented him with a bible, and invited him to join in the 21 days fasting and prayer called by the Assembly of Loving God (ALG) Church. Abu also began preparing for baptism. Pastor Steve’s secret underground house church of Bibles for Mideast is in an area highly hostile to Christianity. Please hold all these believers in your prayers. The following story is from a man who for security reasons, we’ll call Al-Jamali. From a prominent Middle Eastern Arab Muslim family, Al-Jamali up until recently strictly adhered to the five pillars—the basic and foundational tenets—of Islam. About eleven years ago, in 2004, I went on a tour of India with my friend. We were visiting Kanyakumari, the cape of South India, in December that year when gigantic waves began heading to shore. We saw them coming, but not thinking they would affect us on land, I made an effort to take photos. They were, in fact, tsunami waves [generated by the massive magnitude 9.3 undersea earthquake off the coast of Banda Aceh, northern Sumatra—Ed.]. He carried me safely to the shore, completely unharmed. But I couldn’t find my friend, only dead bodies everywhere. I ran out among them, calling out, until I finally realized I would never see that friend again. Hundreds of the bodies could not be identified. While I watched, government authorities gathered them all up, poured gasoline over them, and set them alight. Certainly my friend would have been among them. If God had not saved me, I too would have been burned. Though I got my life back, I could not get over the shock of losing my friend. I know the mighty man had saved me, but somehow that did not affect me as much as missing my friend. I just couldn’t get over it, and lost all peace of mind. I returned to the Middle East alone, and gradually the memories of that horrible day became less strong. But eleven years later, on the same day, December 26th, 2015, I was driving my car along with my wife. By then, I had become a family man and had married two women. The one with me was my second wife. Suddenly, my car rammed into the rear of a truck, while another truck came up from behind and crashed into me. Unfortunately, our air bags didn’t deploy. But I felt the same thing I had back on the day of the tsunami. A strong, mighty man held me, carrying me like a baby in the arms of its mother. I saw the same blood stains on his hands and realized he was the same man who had rescued me from the tsunami. .
“You need only one wife,” he responded. “Lead a life with her, and live for me.” He then vanished. The very next day, two strangers came to my hospital room. They introduced themselves as Pastor Paul and Pastor Steve from Bibles for Mideast. One explained he’d had .a dream from Jesus Christ about me, and that’s why they had come. I welcomed them happily. They explained to me the message of the Gospel and gave me an Arabic Bible. When I opened it, there were the words Jesus had said to me! I accepted him as my personal savior and Lord before the pastors, who then prayed over me. Afterwards I went to my wife’s burial, carrying my bible in my bag. I now study the scriptures, and secretly attend worship services at an underground house church of Bibles for Mideast. For several months, my wife refused to believe in Jesus. I tried to tell her gospel stories, but she didn’t want to hear them. When I mentioned the name of Jesus and talk about his crucifixion and resurrection, she’d become angry and even violent. But the church and I continuously prayed for her. One day she slipped on the floor and broke her hip. She needed surgery, and afterwards, in severe pain, could only rest at home. Whenever I .prayed silently over her, she felt some relief but when I stopped, the pain would return. Slowly though, she began to understand the power of prayer. I was thrilled when she asked me to call the pastors to pray for her. So I called Pastor Paul immediately to see when he could come, and then sent my car to bring him. He arrived with two others. It was in fact the second time he’d come to my house. The first time, my wife had angrily let him know she did not like or want Christians visiting our home. But on this second visit, she welcomed him with a beautiful smile and asked me to pull a chair up for him beside her bed. Pastor Paul helped her understand more about Jesus, and her need for salvation. She readily accepted Jesus as her savior and Lord. Then he got up and started praying for her. I was surprised to see her reach out and take his hands, and then hold them to her head. As a religious Muslim, she never allowed any man except her husband to touch her body. This is an absolute requirement under Shariah law. But with Jesus in her heart, she had totally changed. While Pastor Paul prayed, we all heard some breaking or joining sounds coming from her hip area, and she was totally healed! We had a consultation with her doctor that same day, and since she no longer needed them, all the materials that had been surgically implanted to repair the broken hip were removed. Now I attend the worship service along with my wife and children at Assembly of Loving God, the church organized by Bibles for Mideast.. Please keep our friend Al-Jamali in your prayers. Surely the Lord has huge plans for him! Mr. Julannan hated it when anyone tried to share the gospel of Jesus Christ with him. He and his wife, while members of the Catholic Church, lived worldly lives and looked with contempt on any charismatic Christians they encountered. He had a drinking problem as well. When drunk, he’d become violent both at home and with neighbors. There were times locals found him lying by the roadside in an alcoholic stupor. He especially abhorred people coming to his house to share the message of Jesus. One day, members of a Bibles for Mideast team visited. They handed him gospel tracts which he grabbed, only to then promptly set alight with a nearby box of matches. “Get out of my house!” he yelled as the surprised visitors watched their precious tracts burn. Travelling home from his contracting job one evening, Mr. Julannan passed an open-air gospel convention ground. With contempt, he spat in the direction of those gathered there, and continued on his way. “Jesus is the instant help for your troubles!” he suddenly heard the convention speaker announce. “He is always before you, watching over you, and healing your sicknesses.” He stopped dead in his tracks as the voice continued. The words pierced his heart. That night he couldn’t sleep. He couldn’t shake the feeling—especially when it also invaded his dreams—that something terrible was heading his way. He tried to pray, but didn’t know how. The next day as Mr. Julannan hurried to his job, he noticed with dismay a train approaching the railway crossing along his route. If he waited the long minutes for it to pass, he knew he’d be late for work. So he decided to take his chances and run for it. Partway across, the speeding train barrelled down on him, knocking him flat between the railway tracks. Onlookers screamed as they watched the disaster unfold. As soon as the train passed, he leapt to his feet and off the tracks—without a scratch on his body. To the astonishment of bystanders, he explained how when the train ran over him, he cried out to the Lord Jesus. Immediately, he sensed someone hugging him tightly, cushioning him from the train roaring overhead, like a baby being sheltered by its mother. The Presence then disappeared just as quickly once the train had passed. “I know my Lord and Savior Jesus Christ saved me from what should have been a horrible tragedy!” he repeated with renewed confidence. Since he and his family had no bible at home, Bibles for Mideast provided them with several, which they now read and meditate on daily. Alcohol no longer holds him in its grip. Further, he and his wife have partnered with the ministry to joyfully distribute both bibles and gospel tracts—ablaze now with the fire of the Holy Spirit! Ismail* (50), a fanatic Muslim in South Asia, never liked Christianity. He seized every opportunity to thwart evangelical activities, quarreled constantly with Christian leaders, and even stoned those preaching the gospel at roadside meetings. Ismail’s motorized rickshaw provided his livelihood, but one day in 2006 he decided to use it to take the life of Pastor Paul of Bibles for Mideast, ramming into him on the street. 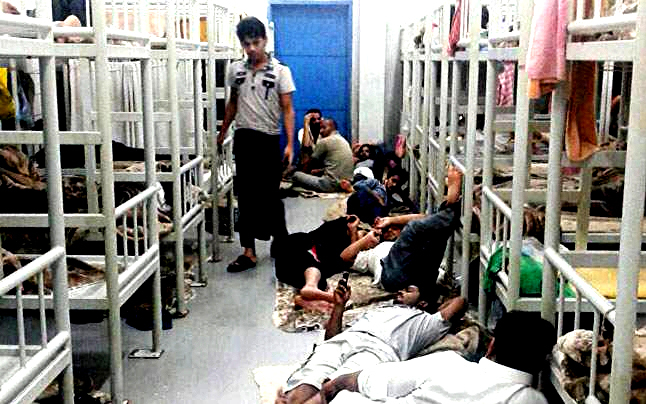 As the mission leader lay in hospital, other fanatics threatened his family at home. Fortunately all family members survived (that story in Christianity Today India here, and another at the Voice of the Martyrs website here). In late 2008, the same man led a mob of extremists in an attack on one of the house churches established by Pastor Paul. 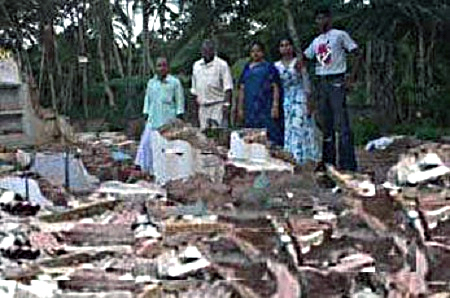 While its leader narrowly escaped with his life, his church was completely demolished (Worthy Network News story here). Ismail and his wife had only one child, Afsal* (15). They had waited years to have the boy, now a local high school student. For months Asfal had been in hospital undergoing treatments following surgery to remove a brain tumor. To afford his son's care, Ismail had been forced to sell his rickshaw, his home, and then to borrow from whomever he could. His anguish grew. “Several days ago, his blood count dropped suddenly,” Dr. A.K., the oncologist, explained. He could present only one diagnosis: leukemia. Ismail and his wife plunged even deeper in despair. They found themselves utterly unable to cope with either the trauma of their dying son, or their spiraling debt. Without telling anyone, before dawn one morning the couple and their boyleft the hospital and headed for a nearby beach. Then, tying one of each of their hands to their son’s, they walked out into the depths of the ocean. Several Christian fishermen had decided to try for an early-morning catch that same day. In the low light of daybreak, they noticed rather odd behavior in some sea-gulls overhead. The birds would approach their boat, make unusual sounds, and then fly back to sea. Gazing along the flight path, the men suddenly became aware of three people sinking beneath the waves in the distance. “O Lord Jesus!” one cried. They rushed to rescue the three, calling on the Lord for continued help. As they pulled the family into the boat, blood trickled from the victims' mouths and nostrils and a strong smell of poison filled the air. In their determination to end their lives, the family had obviously ingested poison before heading into the sea. The fishermen immediately brought them to the nearest hospital. Emergency physicians managed to revive the couple, but hemorrhaging had wrought the boy comatose. Doctors determined he was near death. That same evening, the Lord revealed the whole story to Pastor Paul in a vision—even showing the couple's broken, contrite hearts. So he gathered a prayer team and visited them in the hospital. The doctor, himself a dedicated Christian, allowed them to pray for Afsal and joined in the prayers. Pastor Paul shared his heart with Ismail and his wife. He told of his conversion from Islam to Christianity, and of his own miraculous healing from leukemia. He shared the bible story of the four people who brought a sick man to Jesus by ripping open a roof and lowering him before the Lord. “Jesus healed that man because of his friends’ faith,” Pastor Paul explained to the couple. “He rose from his bed and walked. If you personally believe Jesus Christ is your Lord and Savior, He is able to heal your son Afsal and bring him back to life. It is only because of the Lord you were prevented from committing suicide.” He further explained to them the way of salvation. His wife also declared Jesus Christ to be her personal savior and Lord. The prayer team, doctor and couple all joined hands around Afsal’s bed, rejoicing and praising the Lord. They sang a song of healing as Pastor prayed for the boy. At the end of the prayer, to everyone’s astonishment, Afsal opened his eyes. “The Lord Jesus Christ came to me!” the boy soon explained. “He smiled at me, and put both of His nail-pierced hands to my head and chest. I felt new blood flowing from my heart to my veins, like electricity!” He got out of bed and stood up. He too declared Lord Jesus as his savior. All continued rejoicing in thankful amazement at the miraculous healing. Pastor Paul gave the family bibles. With new-found respect and reverence, they kissed the bibles and held them closely to their chests. Doctors examined the boy thoroughly and declared him to be completely and miraculously healed. To help protect the family, Bibles for Mideast has rented a small house for them away from their former neighborhood. They rejoice in their new faith. Please pray for God’s protection and provision for His precious new family members. “Send your resources out over the seas; eventually you will reap a return.” (Eccl 11:1) . Doctors confirm death of young Lydia … BUT GOD! Doctors this morning (West Africa time) confirmed the death of Lydia (14), the daughter of Yoonus, a Christian missionary with Bibles for Mideast in Africa. She had been in a coma for six days after being brutally subjected to female genital mutilation (FGM) by Muslim radicals on her way home from school last week (see original story here). Brother Yoonus immediately contacted Pastor Paul Ciniraj, Director of Bibles for Mideast and Patron of the Assembly of Loving God. An hour after Lydia’s death, workers removed her body from her hospital room. Her parents, brothers, sisters and other believers surrounded her, sobbing at the tragic loss of their beloved. Doctors, nurses and other hospital staff arrived to have a last look at young Lydia’s lifeless body, now draped in a white cloth. Suddenly, someone noticed the fabric shaking. Could it be wind blowing in from outdoors? The trembling intensified, but now, clearly, the movement came from beneath the cloth. Then, just as suddenly, Lydia herself threw off the white covering and stood from the bed. “Mummy, our Lord Jesus, our Lord and God Jesus Christ!” she exclaimed joyously. “Ghost! Ghost!” someone screamed. A nurse and another hospital worker fainted to the floor. All, including the family, backed away in terror, believing a ghost had appeared. “Mummy, I’m Lydia ... not a ghost,” Lydia reassured her mother. “I’m alive! Jesus gave me my life back, and healed me! See, He’s just disappearing there on the clouds!” She pointed her finger towards the sky. Her overjoyed mother embraced and kissed her repeatedly, praising the Lord Jesus. The rest of the family joined in, as the believers gathered round them sang and clapped ecstatically. Some even danced. While hospital protocol forbad such rambunctious behaviour, no one dared utter a word … let alone of complaint. Amazed, the staff around the family simply had no idea what to do or say. So Lydia continued with her story. Yoonus and his family, as well as Bibles for Mideast and the Assembly of Loving God Church thank each and every one of you who prayed for Lydia. Please keep the ministries in Africa, Asia and Middle East in your prayers always. Thankappan, a taxi driver in South Asia, once despised Christian missionaries. As a fanatic Hindu and active member of an anti-Christian movement, he often spoke out against Christianity and even organized people near Hindu temples to challenge the evangelistic activities of Christians. Once, when an evangelist handed him a Gospel leaflet, he made a public display of burning it. Another time he argued with an evangelist and ended up slapping him. But Christ Jesus captured him and made use of him as a good vessel in His vineyard. And today he testifies Jesus as a miraculous man. One day while driving his taxi a few years ago, he happened to drive near a Gospel meeting on a street corner. Pastor Paul of Bibles for Mideast, himself a convert from Islam to Christianity, led the meeting. Seeing Pastor Paul, a former Muslim, and a former Hindu both witnessing for Christ enraged him. He spat in the diretion of the meeting through his car window. At that very moment–while his anger distracted him—a huge truck ploughed into his car. Thankappan sustained multiple injuries and ended up in a coma in hospital. His intestines, both small and large, protruded from his abdomen. Doctors tried their best, but were unable to reposition them within his body. They declared he had less than a 0.01% hope of survival. So they created a pouch outside his body and just simply kept intestines together as a pack hanging below his waist, and stitched him up. When Thankappan opened his eyes, he saw Pastor Paul praying over him. Others, including his wife, stood nearby with tears in their eyes, expecting his death at any moment. Though he had been unable to speak, he slowly opened his mouth and said to Pastor Paul, “Pastor, I spat at you. I spat at Jesus Christ. I persecuted the Lord Jesus and His servants. Forgive me. Forgive me. Ask my Lord to forgive me.” Then he began to weep deeply. A short time later, someone called for the doctor. He was amazed to see Thankappan had emerged from the coma, speaking and crying. “This is a great miracle!” the doctor exclaimed. Thankappan was baptized and became an evangelist, distributing Christian literature and witnessing about Jesus all over the city. His wife also became a believer and helped him in ministry. When preaching on street corners, he holds the Bible in one hand and reveals his unusual digestive pouch as part of his testimony. His grown children, living with their own families and also once strongly against Christianity have all accepted the Lord Jesus Christ as their Savior. Thankappan still drives cars for his livelihood as well as being involved with our Lord’s ministries. Pray for him and his entire family that they would continue to be used mightily as witnesses for the Lord. Haroon (not his real name) grew up in a prominent Muslim family of the Middle East. His father, a leading religious authority following the dictates of Sharia law, strictly regulated religious behavior in their state. “I was commanding a militant wing to protect the religion and taking immediate operations against its enemies,” explains Haroon, who had trained as a sharp shooter. Early one morning several weeks ago, Haroon got word of a baptismal service to be held in the Arabian Sea. But the service had ended by the time they arrived. Seeing the bus full of Christians driving away, they opened fire. Within seconds, a giant dust storm formed in front of the militants’ vehicles, preventing them from moving forward. Jesus spoke again to them. “I came to the world not to destroy anyone; but to save you. Go in peace.” He then disappeared, as did the dust. Haroon says he and his fighters somehow felt both “terrible fear and an abundant peace” at the same time, something none of them had ever experienced. When they recovered their voices, all but two of them began praising and thanking God. The two dissenters refused to believe God would do such a thing. Argument ensued, and the group left in confusion. Haroon shared the experience with his father, who warned him not to tell anyone else. But he and the men he commanded could no longer pursue military activities. A few days later, Haroon and his family headed to the desert for an evening bonfire. There, his sister Hajira was bitten by a highly poisonous Saharan horned viper and, near death, rushed to hospital. While in a coma she had a vision of an angel who explained to her the truth of Jesus—how He wanted to be both her healer and Savior. When the angel disappeared she became conscious, and noticed her brother at her bedside. She shared the vision with him, and to her surprise found him receptive. Soon realizing they’d had similar experiences, the siblings prayed to Jesus to save and guide them. Shortly afterward, Pastor Paul, Director of Bibles for Mideast, came to the hospital room. He explained to them that he too had been visited by the angel Hajira had seen, and been told to visit them in the hospital. He knew both their names. He explained to Haroon how he had been among the Christians Haroon’s troop had tried to attack that day of the dust storm. Brother and sister confessed their sins, and readily accepted Jesus as their Lord and Savior. When Pastor Paul prayed over them, Hajira was totally healed. Hajira’s healing made a believer of their father, and their whole family and 17 of the men who had witnessed the dust storm soon followed. “We are praying for other two, and also for the Muslim world to be saved,” says Haroon. Hajira (not her real name) grew up in a prominent Middle Eastern Muslim family. Her father, a top religious authority in their state, helped enforce the dictates of Sharia law, particularly those regarding religious matters. She and her brother Haroon (not his real name), the only children of their mother, share other brothers and sisters by their father’s other wives. Her sharp-shooting brother commanded a militant Islamic wing intent on protecting the faith. The large extended family strictly followed Sharia law, and Hajira felt deeply loved by all of them. Once a year, the family—with their cooks, drivers and servants—enjoyed setting off for the desert to enjoy a bonfire under the moonlight. This year they selected some nearby rocky hills for the gathering, Hajira told Bibles for Mideast. After the evening’s festivities, she felt like going on a little walk out further into the desert, and her siblings decided to join her. Their father and mothers remained near the bonfire with the servants. While they walked, she suddenly felt something bite her leg. The siblings saw a big snake slither quickly away, then bury itself in the sand. Haroon grabbed his revolver, took aim, and killed it. 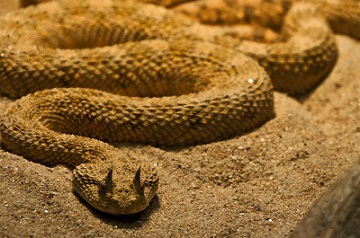 It proved to be a Saharan horned viper, fairly common in the area but with highly toxic venom. Within seconds Hajira became unconscious, and was rushed to hospital. She lay there four days in a coma. She remembers waking up briefly on the fourth day, in severe pain and unable to move. She heard the doctors discussing renal failure and increasing fibrinolysis. Her prognosis was grim. The angel disappeared, and she woke up to see her brother standing beside her bed. She told him about the angel and what he had said, and was surprised when Haroon looked enthralled rather than angry. She then learned of his own experience with Jesus in a dust storm, when he and his team of militants were intent on killing a group of Christians. He shared that remarkable incident with her (you can read it here), and brother and sister then joined hands and prayed. “Jesus, if you are the true savior, heal both our physical and mental sickness,” Hajira continued. “Jesus, if you are the true savior, send somebody to us for further guidance. Amen”. In about two hours, she said, two strangers came to her room unexpectedly. The senior person knew both her and her brother’s names. The elder man introduced himself as Pastor Paul of Bibles for Mideast. He explained to them who Jesus is, why he was crucified and died. Hajira and her brother repented of their sins and accepted Jesus as their Lord and savior. Pastor Paul put his hands on Hajira’s head and prayed. She told the doctors Jesus had healed her. After thoroughly examining her, they accepted her recovery as miraculous. Seeing their precious Hajira restored to health, all her family members accepted Jesus as savior as well..
“Pray that our Lord Jesus protects us and gives us strength to survive persecutions,” she asks. The experience of Haroon (update on Dec 20): At the sound of Jesus’ voice, militants toppled, guns blown from their hands. The ministries of Bibles for Mideast operate on faith alone. We appreciate the support and prayers of the children of God. If you can help in any way, please see the bottom of our Contact Us page. 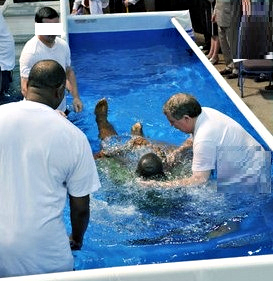 1,268 baptisms and many miracles in three days! By God’s grace, underground house churches of Bibles for Mideast conducted 127 baptismal services across Asia, Africa and the Middle East over the past three days, with 1,268 former Muslims going through the cleansing waters. In Saudi Arabia alone, 613 people in 72 different areas went through the sacred rite. While threats and attacks accompanied the services, so did the miraculous! “Because of police patrolling and the threats of attack from Islamic militants and terrorists, we avoid sea shores for the baptisms and held the services inside of our churches.” Pastor Paul, Director of Bibles for Mideast explains. Most churches arranged to have fiber or polythene water tanks erected inside of their prayer halls. Many did experience attacks or threats. Al Muthalib reported what happened when some radicals attempted to attack the people gathered at his church. Salmath shared the wonders witnessed by all at her church. Water 'boiling' in the tank! So many wonderful accounts have come in we are not even able to report them all. Please keep these new believers in your prayers, and continue to pray for the evangelization of the entire Muslim world. “I sought the Lord, and He answered me; He delivered me from all my fears.